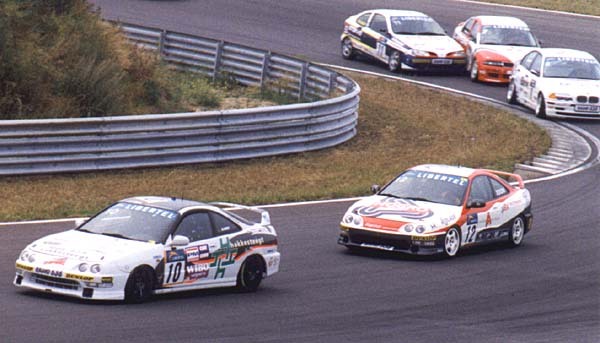 The Honda Integras impressed the whole race. 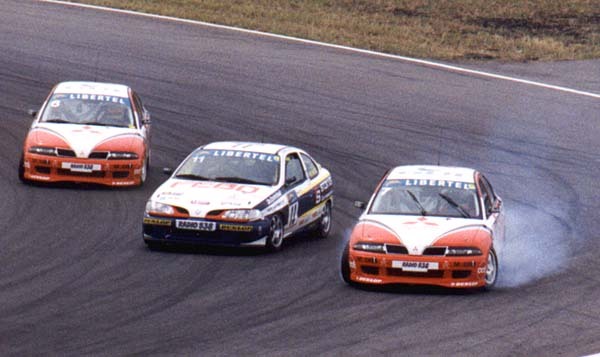 Here you see Rob Karst (number 10) leading the race, closely followed by team-mate Toon van de Haterd. Karst didn't relinquish the lead and finished first in his first competitive outing with this car. Van de Haterd had to give up in lap 8 (of 16) due to engine trouble. 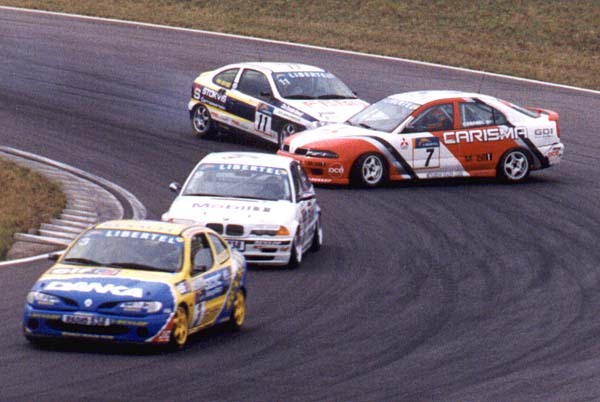 In the background you see Pim van Riet banging his Renault Mégane into the side of the Carisma of Tim Coronel (twin brother of Tom Coronel who won the Japanese F3000 title in 1999). Van Riet drove a very dubious race as you'll see later on. Another mid-field shot: Van Splunteren (#30) carving through the field. The number 31 BMW is driven by Charles Kwan of Hong Kong, who managed to finish in 15th place. Van Splunteren got as far as 8th place but then received team orders to fall back in order to let Tim Coronel past and finished a disappointing 13th. So why should Van Splunteren drop back to let Coronel past when he was in 8th and Coronel in 5th? Well, here's why: Van Riet kept badgering Coronel and ultimately he was pushed off the track. 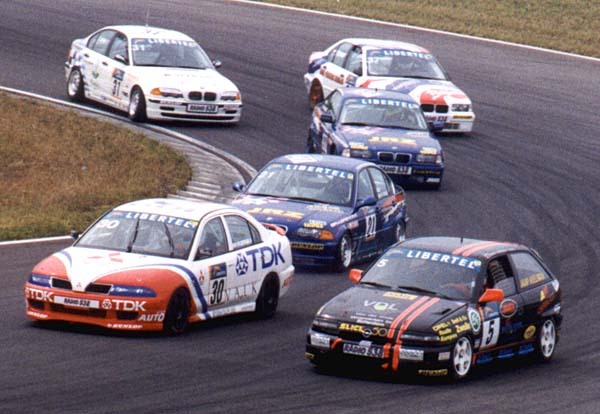 On this picture you see Marcel van Alderden's Mégane in 3rd, Euser's BMW in 4th, Coronel sideways in 5th and the pushy Van Riet in 6th place. Some laps later: Van Riet still hasn't managed to get past Coronel, but now Coronel's team-mate and championship candidate Allard Kalff is diving for the inside to make 5th place. And finally Van Riet got past Coronel, but at some cost. 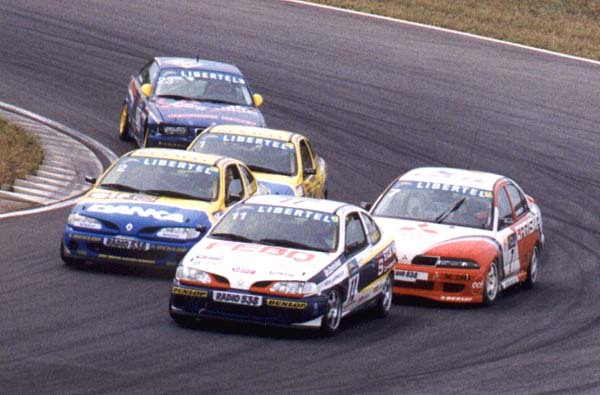 The Méganes of Frans Verschuur (number 2) and Donald Molenaar (number 1 and last year's champion) had closed in and now also were in the fight for 6th place.